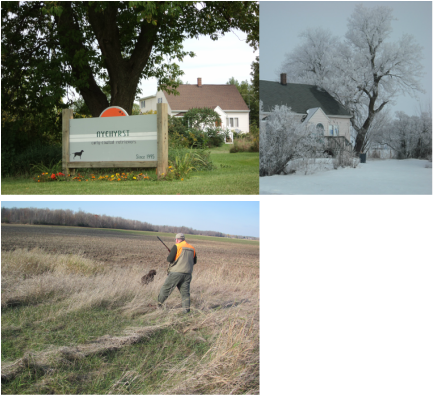 We have been breeding curly-coated retrievers since 1995 near Green Bay, Wisconsin. Our goal is to make an all-around retriever who is a willing worker and a problem-solver in the field. 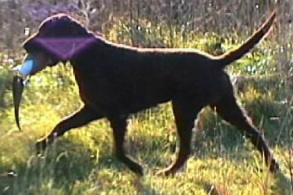 The curly is an upland flusher who is just as at home in the water as in the field. He is even more at home on your couch! We strive for an easy, even-tempered dog that can go to the field, the show ring, or the backyard to play with the kids with equal ease. Nyehyrst. We have four acres of corn and four acres of restored prairie on either side of the house. Above, I'm training a pup on the north field. Magee (CH Ranah's Mahogany Glide CD WC ROM), our founding sire. A multiple group-winner shown training in the west field. We got our first curly, Magee, from Gina Columbo in 1995. He retired from the show ring in September, 2003 as an all-time top ten all-breed winning curly. He sired the Nyehyrst B, C, E, G, and H litters. His greatest accomplishment, however, was in the field as a pheasant-producing machine--easily the best pheasant dog I've ever seen. Twenty years later Magee's stamp is still apparent through his sons and daughters, producing natural working retrievers that are eager workers in the field and easy companions in the home. Bred for correct curly temperament, working ability, and correct curly type in the breed ring. Just keep hunting Magee. I'll catch up to you later.